A one year old notices things that escapes the attention of adults. A child’s eye-level is closer to the ground. 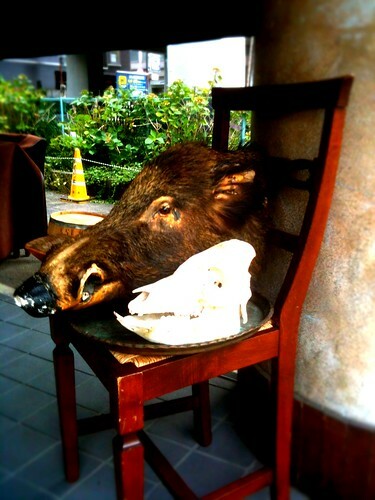 Like the boar’s head and skull on the chair below that Moka strenuously pointed to, and then gravely stared at. I wonder what the restaurant was trying to advertise with this display? Do they serve a lot of gamey pork? Is it an establishment where ‘men can be men’? Are hunters and taxidermists welcome? Is it a warning to those born in the year of the boar? Moka didn’t seem interested in finding out so we moved on. 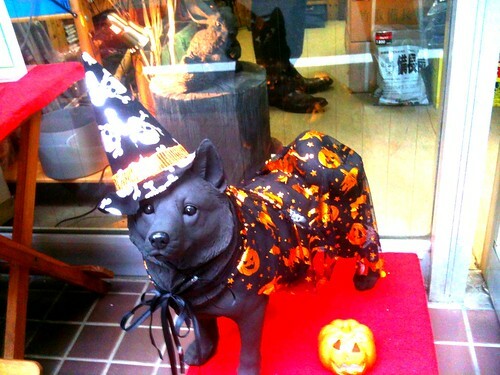 Moka also drew my attention to this charcoal sculpture of a dog adorned in seasonal Halloween garb. I don’t know for sure if the sculpture was made of charcoal. She wanted to go into the store because there were shelves of these sculptures of all kinds of animals. They looked to me like charcoal. I had never noticed this neighborhood store before. 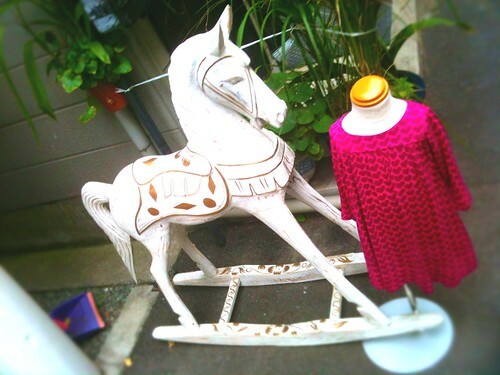 This hobby horse was tucked away in an alley outside a very expensive children’s clothing store. We were on the main street when Moka shrieked out in delight and pointed down to the elegant wood carving. 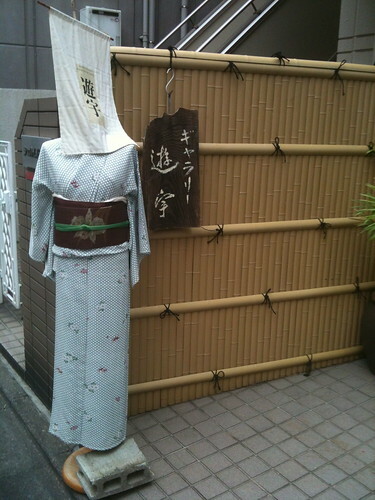 The beflagged mannequin in a kimono was something I noticed, but Moka had no interest in. She was clearly on a mission for animals only. 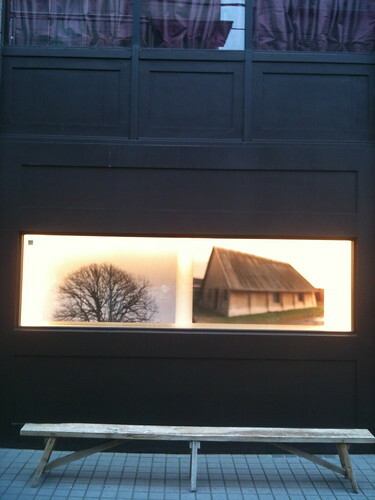 And finally, we were both intrigued by the intentionally blurry photos of this storefront. I especially liked the placement of the bench. I couldn’t figure out which of the 4 businesses in the building this display was supposed to represent. None of them were related to photography or art or rustic furniture. Maybe it’s okay not to know what a business is before you enter it. The zoo in the storefront is perhaps just to get your attention. The adventure is in stepping through that door. Beats me. I think there will always be ideas that jump out of nowhere. Just random stuff got you thinking I suppose. Yet everything there looks so charming and beautiful . . . .